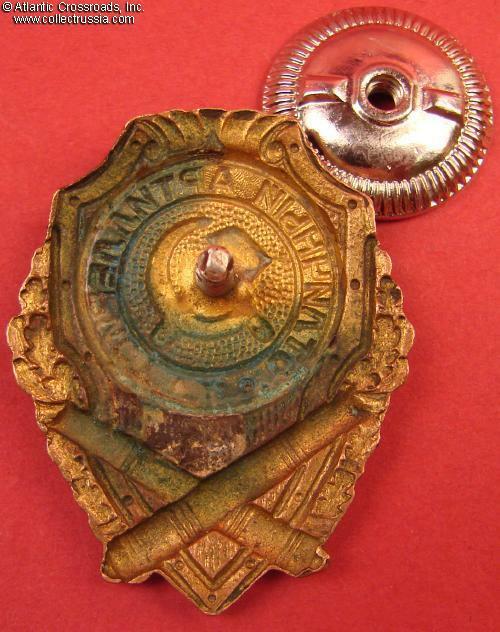 Excellent Artilleryman badge, variation made in occupied Germany, circa late 1940s. Brass, enamels; 46.4 x 37.0 mm. 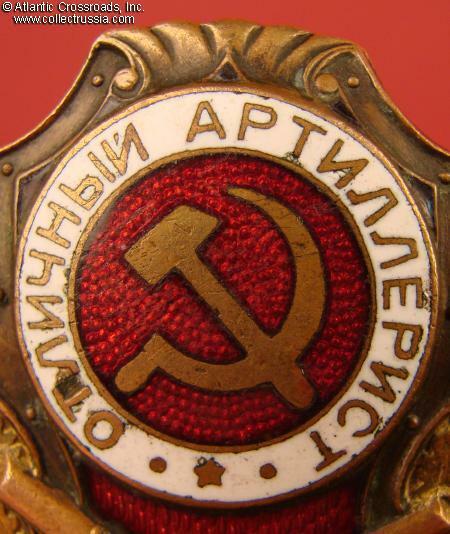 Features thick hammer and sickle emblem, dot pattern under red enamel and very distinctive scrolls in the top ornament. This scarce version was produced in the Soviet zone of occupation in Germany soon after the war. 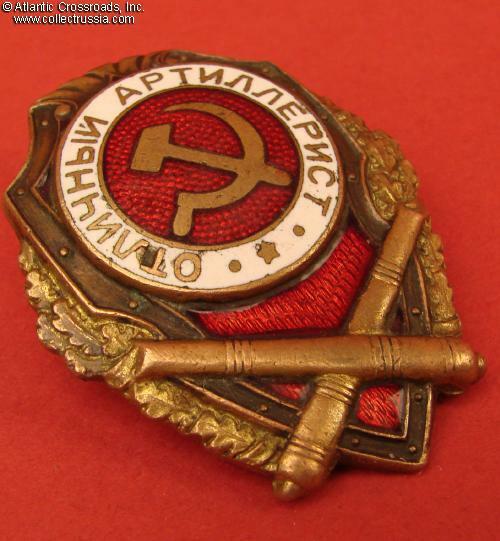 Airapetyan referred to the manufacturer as "NKPS Experimental Factory" and rated this type "exceptionally rare" (rarity rating 5) in the "Breast Badges of the Red Army, 1941-1945" /see p. 92 fig. 17/. In very fine condition. The red enamel in the center medallion shows surface scratches and extensive buffing but no chips or repairs. The enamel in the white band has a small chip at approximately 8 o'clock position and a number of smaller surface flakes and scratches. The less exposed red enamel in the lower portion of the badge is nearly pristine with only a couple of tiny scratches, retains very attractive luster. 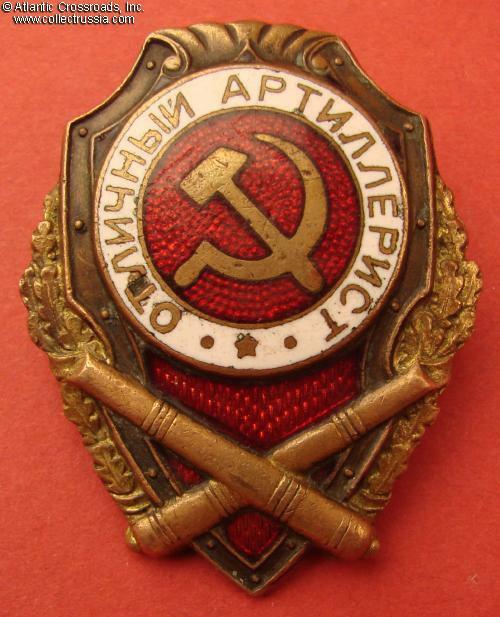 It must be noted that enamel on the German made proficiency badges was somewhat more prone to damage than on their Soviet-made counterparts. The details of the cannon and wreath are very well defined. The reverse shows verdigris to brass but good amount of the original fire gilt finish is still present. 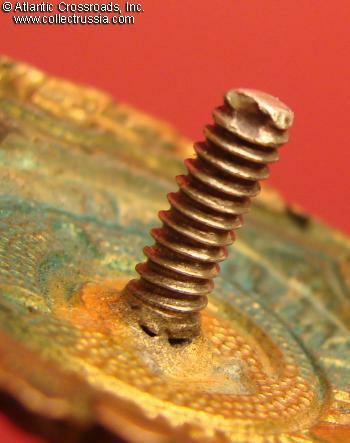 The screw post is approx. 10.5 mm, full or nearly full length. Comes with original screw plate which is nearly identical in shape and size to a common NKPS screw plate but is in white metal and lacks the NKPS markings. A very unusual and interesting piece!